This is how you access and replace the water pump on a S series saturn (SL, SL1, SL2 sedans and wagons, and likely all other 1.9L SOHC and DOHC saturn cars). This is a common failure on these motors and is relativity cheap and easy to replace yourself with a common set of mechanics tools. IF YOUR CAR IS LEAKING COOLANT near the passenger front tire, this is the most likely cause. It is hard to see where it is coming from, but its a safe bet that this is the location. I apologize, I had a video segment that go corrupted showing the splash guard removed. There is only one piece that needs to come out, not the entire thing. Thanks for the video. What size wrench did you use for the pulley bolts and the water pump bolts? Thanks for the video. Didn't even think about the tire and splash guard. I was afraid I was going to have to pull the compressor. 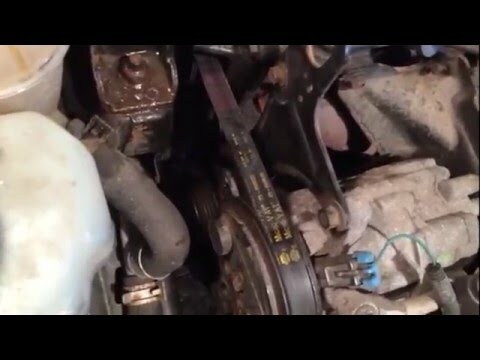 Would the 1986 saturn waterpump work In the 1997 saturn? I didn't know the shroud between the wheel and the engine comes off. It seems the water pump is easier to get at. Thanks. Great video. Why did you not show what you did to take the pulley out? Did you have to mess with the motor to get it out? You DO NOT have to take it out just move it in front of the water pump theres better videos showing the way to do this showing EVERYTHING. Most videos in here need to be removed as to not showing EVERYTHING you need to see like this one. what size wrenches you using? Looks like you're using a GMB replacement. How's it holding up? Thank you for the Video. Your explanations are thorough & understandable. On your next one (& I hope there is another) PLEASE get rid of the very distracting & sometimes overwhelming background music. It detracts from your voice & presentation. But thanks anyway.